Several afternoons ago, the kiddos and I ventured out to the Chicago Botanic Garden to picnic, shoot some photos and do a special, surprise project. They were so stoked about the surprise project and picnic that they didn't even know what I was doing. But I'll tell you what I was up to: secret homeschooling. On the weekends or even weekdays when I need to engage all four of my kiddos meaningfully without it feeling like school, I think up a secret homeschooling plan that couldn't ever be labeled as school work in their minds. The Chicago Botanic Garden has become one of my go-to places for secret homeschooling. And you don't really actually have to be a homeschooler to do this secret homeschool project; you could just be a person who loves autumn and wants to enjoy the heck out of it with the added bonus of secretly homeschooling your kids on a weekend, nonetheless! Present it like this: ok, guys, let's explore and find the most beautiful place we can. Once you agree on a place, we'll start a project! You have 20 minutes - go! Giving a time limit makes it into a race, so my kids take off quickly and burn some energy before we sit down to recreate our favorite space on paper. 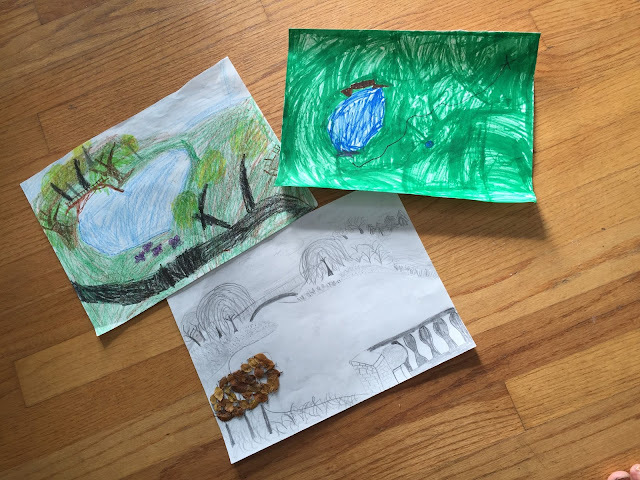 Once they find their "most beautiful place," share with them that you'll come back again to the same exact spot to draw a stunningly different picture during a different season. If your kids are anything like mine, they are motivated by finished product, too, so I offer to take all four pictures and compile them into a large frame for hanging in our home. This also helps for getting them to do their best work! Though not all of my children love art equally, they enjoy working outside and put quite a bit of effort into their pictures. Well, the bigger three worked and put in quite a bit of effort for about 40 minutes. Our three year old worked and put in quite a bit of effort for about four minutes. She then played in the dirt, leaves and with sticks nearby, which kept her mostly happy and me mostly sane. There's more, of course, too, that I'm sure they are gathering with all of their senses! All in all, it was a big win, and I promised the kids another round of this project on a nice winter day for a new view of the same scene. There's still plenty of beautiful days left! Go enjoy one!